Having trouble always with video sharing? if you feel Youtube asks for your efforts in uploading a video because of the account and channel registration, and leaves you with no option to keep a video share anonymous, there is a new service which would help – Vidd.me. It is the simplest way to publish and share videos. 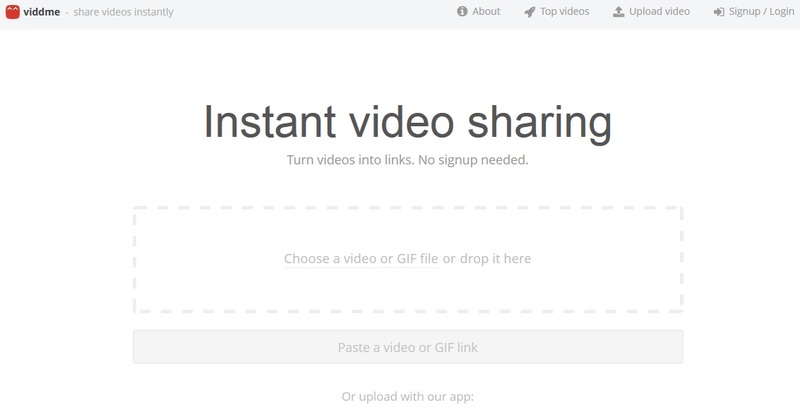 It’s the first video sharing app to let you upload videos without having to create an account. There you go, quite some anonymity, right? It is a pretty simple website, where once you upload the video, it would generate a short URL which you can use and share with your friends anywhere. The video player is pretty large and you get all the social sharing options along with the comment box to share the views. As you see, there is a direct drop box where you can drop the video file, or any GIF file which would be converted to a video. The video would get uploaded instantly, after you enter the video details – Title and description. Nothing else is asked except these details. The video player has all the standard options – Play / pause, Volume toggle and the button to enter or exit the fullscreen mode. There are no keyboard shortcuts though. There’s a direct link to the Top videos section which would show the best viewed videos on the website. The good thing is that you would be able to preview the video by just hovering the mouse over the video icon. Below the video, the only information provided is – Video title and description, number of views and the date of publishing the video. Apart from these, there are social sharing options and also the Disqus comments section if you wanted to share your views about the video. Embedding the Vidd.me video on your website – This is possible, where you get the link to code to embed the video just below the video itself, and here is an example video that we embedded here to show how it looks like. Managing the videos here means – Editing the options and deleting the video. But for this, you will have to create an account. Although it’s optional, you will have the managing options only if you have an account there. About Vidd.me: The service is one of three projects created by Bit Kitchen, a product lab founded by Alex Benzer, previously founder and CEO at L.A.-based SocialEngine, and Warren Shaeffer, previously COO at SocialEngine, alongside two of SocialEngine’s top engineers.